You see, one fact about my Grandfather that I hadn’t mentioned, and essentially through the whole lineage of my family was music. He was a trained violinist under his dad, and his dad, and all the way back through life. 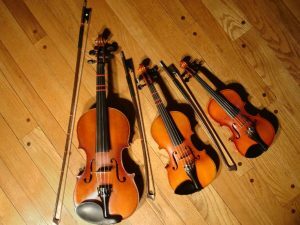 And though construction and trade was the name of the game when it came to our family’s careers, violin in all forms was the passion. Our family had been hand crafting them for generations, and my Grandfather’s first, right from Latvia had always been a focal point on the mantle of their home, which he would break out after a long day at work, while my Grandmother and the family danced. My Mom’s generation followed in the manual labor footsteps, my two Uncles becoming a roofer and painter respectively, and my one Aunt found work in her own Landscaping company. The other two members, including my mom went into the service industry, and yet none of them followed with the music. When my mom was still relatively young, she became pregnant with me. This was not a good thing, and something my Grandfather reacted terribly to. Old fashioned standards, even in the last few months of the Seventies, were to be adhered to, and being out of wedlock and pregnant was a no go. This caused a rift in the family for a while. With my Grandfather pouring himself into his drywall, the other family members into painting, roofing, landscaping, and serving. It was something that took quite a few years to mend, and it wasn’t until I was out of toddler phases in life that my Grandfather actually took more than a passing interest in me. Not my own fault, but those times are passed, and we’ve all since moved on. The reason we started to bond though, was over the music. I was fascinated with that violin from the first time I heard it, and seemed to be the only member in my family who actually paid attention to it. Through my childhood, teens and into young adulthood, I learned everything I could from him about it. How to play it, and eventually how to craft them myself. I started to lean towards my mother’s work approach, which my Grandfather always tried to correct. In our family, you work hard. An honest days work for an honest days pay, and when my Grandfather spoke of honest work, he meant work with your hands. Either in drywall, or painting, or roofing, or construction, or building of any sort was the path that our family had travelled for years, and already two of his children were diverging from that path, he needed to correct that lean with the next generation, and by being the oldest male in the family, that essentially meant me. So when I began to work in coffee shops, and restaurants, the rift between us started to grow again. It was another time that took a while for him to come around to, but it is what it is.